I am linking up with Skywatch Friday, Good Fences, Friday's Hunt and The Barn Collective. I hope you can join in on the fun and share your fence scenes and pretty skies. I am sharing some backyard scenes, skies and neighborhood barns. Maybe some birds too. We are going on 27 years living in this rural area, we see lots of farms and old barns no longer in use. It is sad to see these old farms and land turn into McMansions. 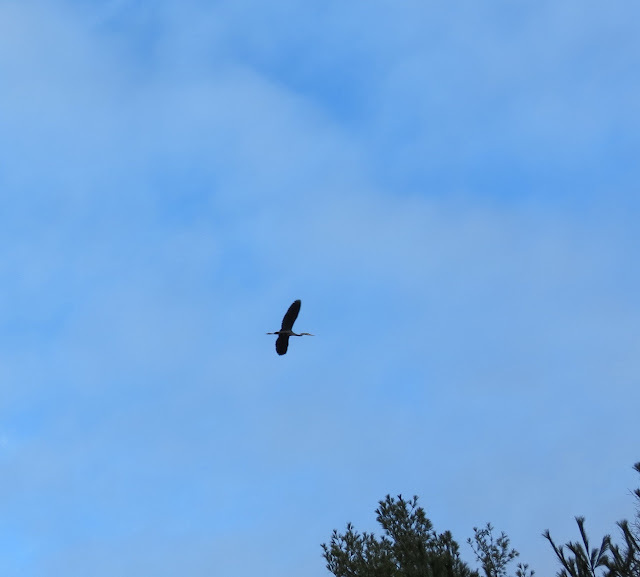 A Great Blue Heron flying over our yard. 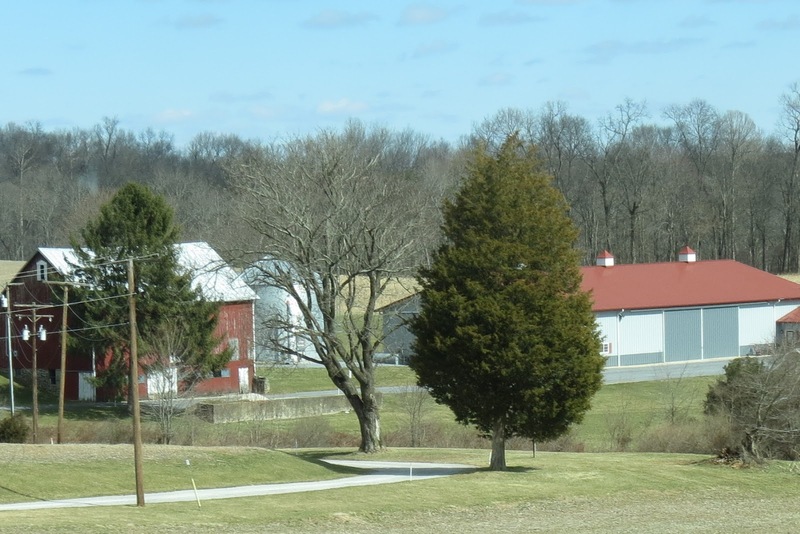 Below are some drive-by shots of local neighborhood farms, barns and fences. Another one of my favorite scenes and photos, a local horse farm. 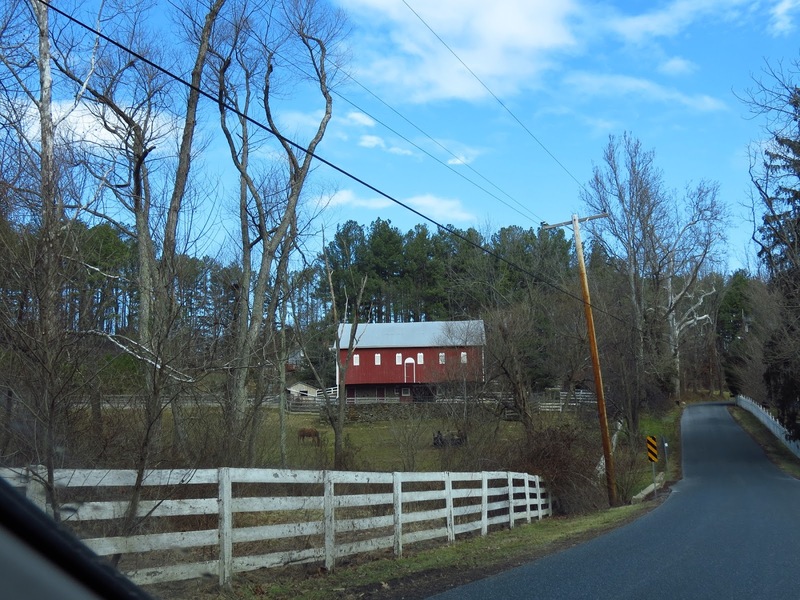 A drive-by street with fences on both sides of the street and a nice red barn with a horse. For Friday's Hunt. Thanks to Teresa for hosting Friday's Hunt. Above my favorite skywatch photo. From my deck a pretty view of the sky and contrail. When my son was living at home he had his homemade backyard firepit, pull up a seat. Down the hill are our shed, redbud tree and some butterfly bushes and our neighbors fence. 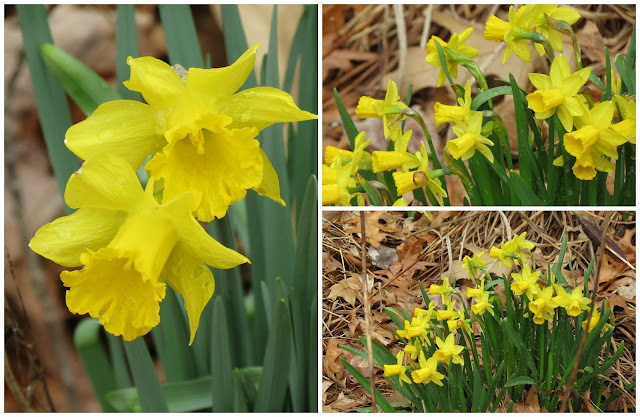 So far, daffodils are the only blooms we are seeing on our yard. for the letter N outside my window, I have a White-breasted Nuthatch looking at me. Another week's favorite, I still have some of Goldie Girl's hair for the birds to use in their nest, check out the Titmouse with a mouthful. 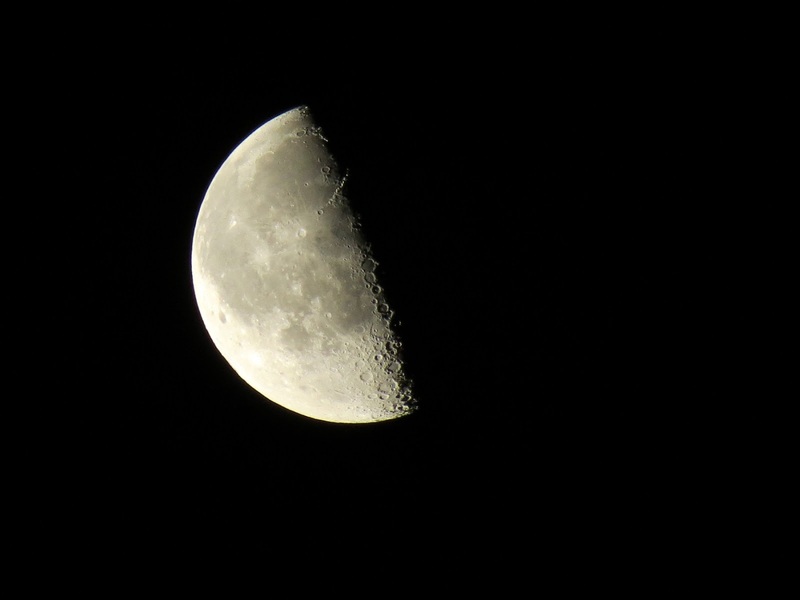 My moon shot, another favorite. Thank so much for stopping by and for the nice comments. To see more pretty skies, fences, barns and fantastic photos from around the world please visit the memes below. I wish everyone a happy day and weekend ahead.. Pretty daffodils too! Here they have not come yet, but soon. I wish you a nice weekend ahead! Hello Eileen! You live in an idyllic rural area. Those farms are so pretty and I love the big red barn. Lovely sky shots and especially of the moon. I had a good laugh at the Titmouse picking at Goldie Girl's hair!! The chick will feel quite comfy in there!!! Naturally, I love you moon photo! Warm hugs and enjoy your WE! Good Morning, Eileen. Very nice photos. So precious that Goldie Girl's soft fur will line the bird's nest this spring. Beautiful shot of the nut hatch and I love the horse farm. Enjoy your day. Those daffodils certainly make a colorful "splash" , don't they? Love those first blooms of spring. Nice to read your post. Thanks for all pics. Here we are on the last day of March and yet again you've given us a wonderful collection to look at. How wonderful that the birds are still using Goldie Girl's hair for their nest,I do like the picture with the Titmouse. Enjoy your day - Happy 1st April for tomorrow, and hope you have a lovely weekend too. That titmouse has so much, I don't see how it sees to get where it is going. Love your fence shots this week! Great variety of photos. Thanks for the reminder to put out some nesting materials. Happy Day. Almost forgot the daffodils, beautiful! A very beautiful place for living, indeed! Wonderful captures, as always, Eileen! 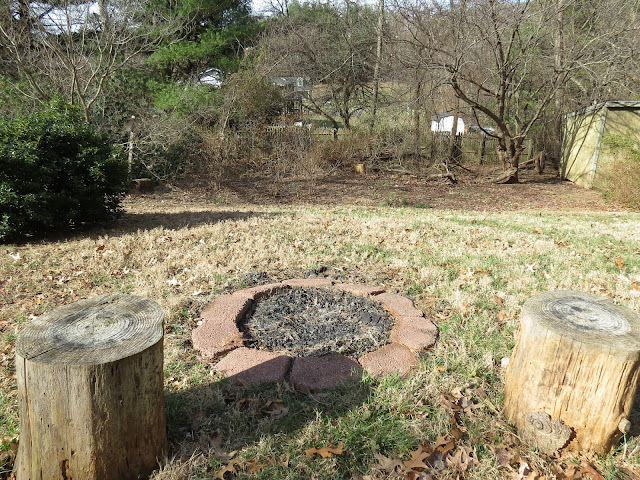 Does the backyard firepit still get use? I love sitting in our back yard at the fire pt; so relaxing. LOL! I would not have seen the bird if you hadn't said so- he was taking twice the limit there, wasn't he?! Love the red barn..that would make me happy to see on a morning's drive. i really like that red barn photo.. and if we had room in our back yard i would love to have a fire pit like yours.. if i could afford a mcmansion i would restore the old buildings and barns instead. Hello Eillen! :) You live in a beautiful area, with lovely rural scenes with fences. I especally like the one with the red barn, and love the flight shot of the heron. My husband was impressed with your cage full of dog hair. It's such a neat idea, and like that, the birds can take as they need it, but the Titmouse could practically make a nest out of all the hair he is gathering. :))That's such a great shot! Have a happy day, and good weekend Eileen. Hi Eileen! Lovely images! I especially like the horse farm and your stunning daffodils! Have a beautiful day! It is a beautiful countryside. The local horse farm is vast and beautiful. Beautiful blue sky and I always love your daffodils and birds. Ha ha I could hardly see the Titmouse with so much of Goldie Girl's hair in its mouth. Wow, what an extraordinary photo of the Moon!!! And my favorite photo is the one of the nuthatch! Thank you! I do so enjoy visiting here! How sweet . . . the Titmouse . . .
You saved some of Goldie Girls hair . . . I miss seeing her . . . bet you really do! Neat fence shots along with other beautiful photography! Beautiful fence pics, Eileen! And I adore the little White-breasted Nuthatch. We must be on the same wave as my post today has the same lil bird. Lovely photos . Thanks for sharing , Have a good day ! it was fun having a tour of your yard! you live in a wonderful area eileen, lots to see in the sky and all around that area!! your daffodils are so beautiful and do the nuthatches migrate?? all of a sudden i have been seeing several at my feeders!!! You live in an idyllic rural area. Wonderful pictures. What lovely scenery and shots. Fabulous skies, fences, barns, flowers and creatures! Have a lovely weekend! All wonderful shots. I love the little birdy with a mouthful (beakful) of hair. Sweet. I never heard the word McMansions before Eileen. But I think I know what you mean about all the old buildings, ways of life and wildlife habitat being "modernised". Nice to see your daffodils - it mostly all we have at the moment. Super shots of the White-breasted Nuthatch and it's good to see them in the throes of the nesting season. Have a great remainder of the week. See you at weekend. that looks a nice area to live near. Lovely rural scenes and nice flowers too! Great photos! The roadside flowers, the barns and homes are all just so lovely! My two favorites today...the nuthatch and that beautiful scene along the country road!! Wonderful fence finds. I really liked the 3rd photo down. - Oh I forgot to mentione that was a great shot of the heron flying. - Fun to see the Nuthatch with the dog hair for it's nest. Hi Eileen, what wonderful photos. I never thought of putting out nest building materials for the birds. That was a great shot with the mouthful! Lovely fenced scenes! Hope you have a good end of the week! That titmouse has a mouthful! What a sweet memorial to Goldy Girl -- adding to the pleasure of your backyard birds. 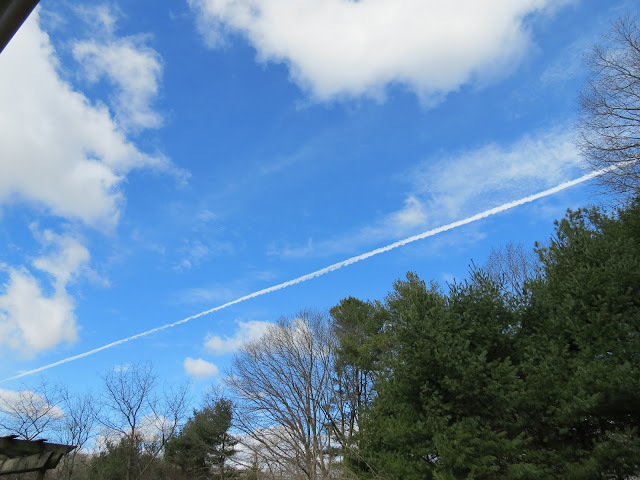 It really looks beautiful this Spring up around your place -- all those blue skies -- wonderful color; it has to be so nice to have it back again! Great shots of your back yard. Thanks for the tour of your wonderful neighborhood! Love the shot of the Nuthatch, Eileen! Love that fire pit, and the seats are good too. Lovely Eileen...I have been searching the skies for herons but none back yet. Beautiful countryside. Love all your photos. That moon once again - fabulous. All of these are really gorgeous, Eileen! You are on your way to a beautiful spring! 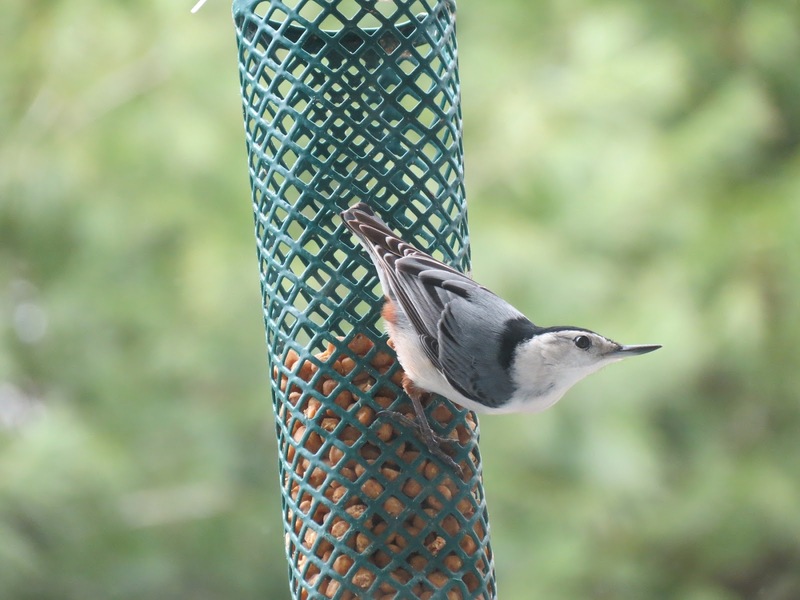 Sweet photos of the Titmouse and Nuthatch! The moon shot is superb. You really give us a treat today. All the various sights are wonderful. You do very well with your photos. I almost missed the titmouse with his Santa whiskers! LOL Lovely scenery and skies. Great shots, Eileen...beautiful country scenes! Have a great weekend! Wonderful captures from the yard. My favorites are the local horse farm and, of course, the beautiful moon capture!! The fourth shot is my favorite along with the moon and the birds! I enjoyed your post a lot. My favourite is the shot of the moon - fantastic! Great photos, Eileen. The third from the top is my favorite, it looks like a work of art. Wonderful series of photos. The photo of that little White-breasted Nuthatch is my favorite. I also give my dog Malla's hair for the birds to use in their nest. It is sad to see the rural countryside eaten up by suburbia. That is an interesting way to recycle Goldie. I love the photo of the titmouse! Belo trabalho e fotografias fantásticas. The horse barn looks pretty neat! Love your photo of the nuthatch, and it looks like the titmouse is keeping busy! Beautiful to see daffodils blooming! I'm looking forward to seeing them again here one of these days. :) Thanks for sharing all the lovely photos. Lovely pics, Eileen. The nuthatch is one of my favorite birds. Such beautiful photos of the idyllic setting you call home. But my favorites are the birds. Amazing shots - and love the little one helping himself to Goldie's hair! I'm sure you'll be able to spot that clump up in a tree very soon! Great photos, Eileen! In this post all the pictures are my favourites. The one of the little bird with a mouthful of Goldie Girl's hair is priceless. Wishing you a lovely weekend and a happy month of April! Hellllllooooo? Can anyone see my comment way down here? ;-) hahah. Love the photos. I feel a heavy sigh about McMansions too. I like the simple country life these days. They are building a new and huge subdivision near us and....sigh. I wish they were plowing out a cow field or putting up a barn instead. I love the tour around your area! Thanks so much for your comments on my blog. Have a great weekend! cheers. Wonderful skies and landscapes, Eileen. Lovely photos, White-breasted Nuthatch is a nice looking bird. Loved all the pictures so lovingly captured!! Lovely shots! Yes, it's sad when farms disappear. 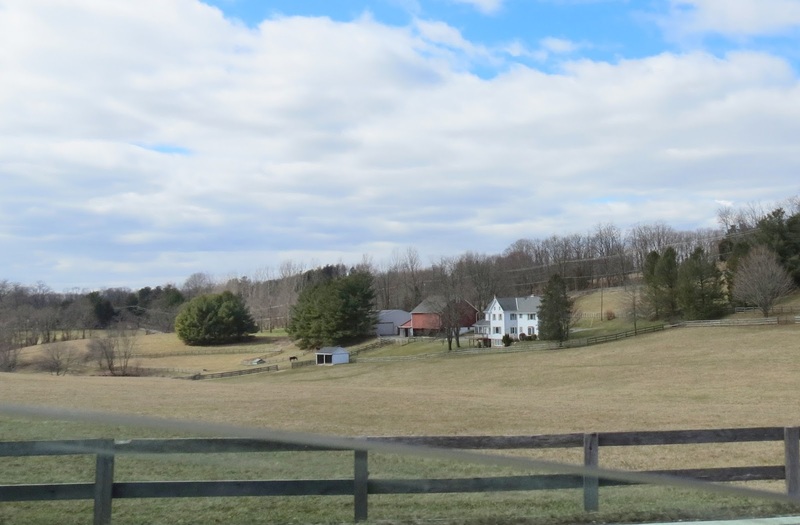 Loudoun County is an example and some areas are so congested! Yet public transit is almost nonexistent, unlike in the city where you have an alternative to wasting your time behind the wheel. One good thing about the real estate slow-down is that areas like where I live (near Strasburg) got a reprieve from rampant development. Goodness. I almost didn't see the bird for all the fur in his mouth. LOL I want to use some of Llenny's wool for the birds in the future. Love the second farm scene! Thanks so much for sharing with Friday's Hunt. Let's hear it for the Nutchatch, Eileen. A really good photo. Great series of photos for N this week, I shared some nuthatch photos too. I do the same - when I shave Augie, I put his hair in the winter feeder for the birds to use!!! You know Eileen, after I saw you putting Goldie's hair out for the birds I asked the dog groomer for some when Topaz was done last week. She game me a big bag of multicoloured fur and I think I have the same cage to put some out in. I meant to ask you, just hang it in a tree or should it be near a feeder for the best results? Love all the scenes...the gorgeous daffodils, the little bird and the fascinating moon in macro!! Of course, the image of the street with the barn and the horse...it makes me smile and reminds me of my road travel ... Always lovely to see through your lens!! Best regards in April! Greetings in Spring! I especially love the picture of the bird with a mouthful of hair for it's nest! Great idea! Hi Eileen....I love the daffodils...I am just planting my bulbs atm for a spring showing! I was interested to see your goldie's fur being picked by a bird...I was putting our Labradoodle's beautiful soft fur out for the birds but none of them seemed interested!